So you want to make a poison dart like the Indigenous South Americans you see in the Hollywood movies, but don’t want to thoughtlessly harm yourself in the process. Instead of aborting your plan you sift through the internet to find someone who has done it before…right. Well to avoid accidentally harming yourself I would advise you not to attempt to make poison darts in the first place. The dart must hit with enough force to reach the dermis layer of the skin where blood vessels are. If the toxin only penetrates into the epidermis there may be delayed or no effect due to the lack of blood vessels in this layer of the skin. Once the poison enters into blood vessels, it will can spread to other location in the body. 3. Absorption of toxin by skeletal muscles needed for respiration. Skeletal muscles are muscles that are under voluntarily control. 4. Interruption of skeletal muscle contractions needed for respiration and flaccid paralysis. Flaccid paralysis occurs when the mechanism of muscle contraction is interrupted by the curare toxin. Curare is an antagonist to the Acetocholine (Ach) receptors known as “Nicotinic Receptors”. These receptors are found at the motor end plate (MEP) of neuromuscular junctions, and are necessary for muscle contraction. 5. Death by Asphyxiation due to flaccid paralysis. If muscles need for respiration ( oxygen/carbon dioxide exchange) cannot function, the target will die due to asphyxiation. Simply put, if you are affected by the toxin curare you will lose the ability to move and suffocate because your lungs will not be able to function. However, if artificial means of delivering air in and out of your lungs(like a ventilator) is available, then breathing can continue, and you would probably live to tell your story to all your friends and family. The Indigenous South Americans had more practical methods of surviving from the effects of curare. One of these was submersing the affected animal in water and giving large amounts of rum. This helps maintain respiration. When combatants received injuries from a curare tipped weapon, the injury was excised, and rock salt was poured on the injury. Like any other substance found in nature, curare must be handled properly to be a beneficial resource to humans. 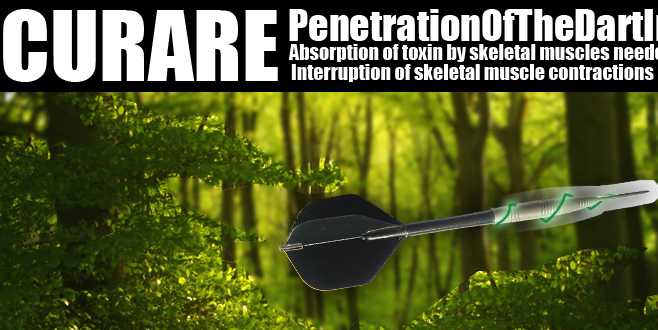 While Curare can be used to for hunting, it can also be used as a treatment for muscle conditions if maintained in a localized area. Since I failed to mention this earlier,the main ingredient of curare is an extract from a plant found in South America. The plants most commonly used to make curare are found in the Strychnos Genus . Some plants in the Strychnos genus carry out photosynthesis and produce fruit, while other species can produce poisons. The plant and other ingredients are soaked in a warm liquid to extract the active ingredient. This aqueous mixture can then be concentrated and set aside to harden into a paste. Simple steps IF you know what to do. There are also pharmaceutical companies that synthetically make the curare but, this can not be made with everyday items that I am aware of. Hello! My brother has recommended me to have a look at your blog. And I’d like to say that I really like what you’re doing here. Heya! Fantastic thought, but will this genuinely do the job? Curare is used to this day for hunting purposes. I have not actually seen curare in action, but the science behind how it would effect body systems is accurate. Fascinating read. There is certainly currently quite lots of facts close to this subject matter all-around and about on the net and some are most defintely better than others. You might have caught the detail right here just correct which makes for a refreshing change – thanks. I saw something about this topic on TV last night. Good article. Hello I was just checking If somebody could help me out with this , I view this blog a fair bit but sometimes the background keeps messing up and I cant read the text. thanks for the link. You are more than welcome to link back to this website. i notice the site loads slower using internet explorer(not the best browser), and there were a few loading errors on some pages that I had to fix recently. So, the loading problem should be fixed now. hmm I don’t have any experience making hunting darts so I’m hesitant to advise people on that, but I could look into that. thanks for the advice. There is no vaccine for curare I know of. Vaccines prepare your immune system for infections against a particular disease caused by a virus or bacteria. Curare poison simply contains molecules/proteins rather than living organisms like bacteria. The molecules however are dangerous since they binds to the same location nerves and muscles interact,and cause paralysis.